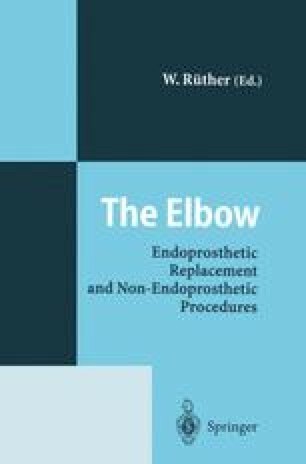 The Guildford elbow is a dual-component, unlinked replacement of the humero-ulnar joint and is combined with radial head excision. The prototype prosthesis was developed in co-operation with the Biological Engineering Department of Surrey University, Guildford. The first joint was inserted in 1980. Since then, certain modifications in design and surgical technique have been made as a result of clinical experience. There are right and left components, but only one size of each component .